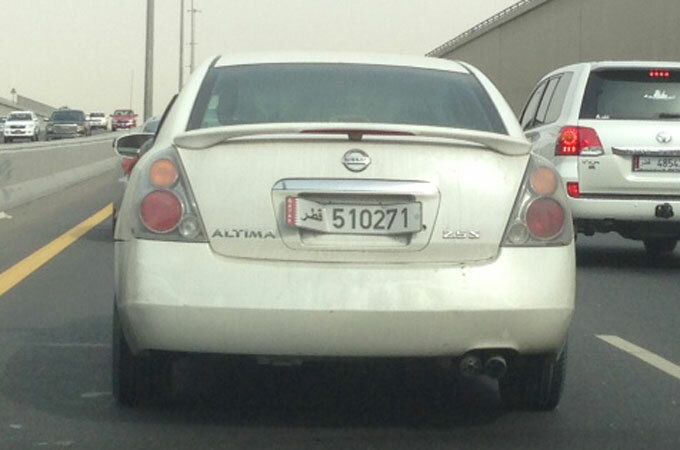 Last year in Doha, new number plates were phased in. You have to register your car every year, to prove you have insurance and your car is roadworthy. When you registered it last year, they kindly made you some brand spanking new number plates. Plates here used to have both Arabic and Western numbers, but they’ve decided to get rid of the Arabic ones. The numbers are now far larger and clearer…and presumably easier to scan and record for booking and fining reasons. Eeek. Anyway, last year when you registered your car, they asked you whether the number plates on your car were long and thin, or short and fat. If you got it wrong, you ended up with a number plate which didn’t fit on your car properly. This mean you either had to pay for a new number plate, or do a bit of crafty fixing. I saw this one on my way to work today – I’ve blanked out one of the numbers to spare any blushes!